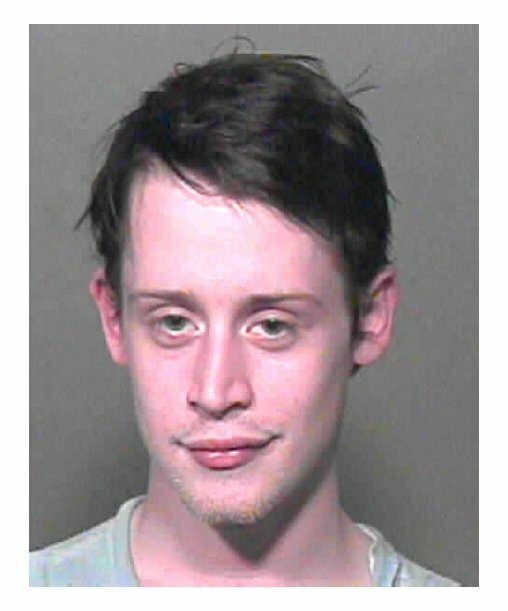 Macaulay Culkin was nabbed in Oklahoma for possession of marijuana and two controlled dangerous substances (Xanax and sleeping pills) for which he did not have a prescription. The bleary-eyed actor, 24, posed for the above Oklahoma County Sheriff's Office mug shot following a traffic stop of his buddy's car in September 2004. Culkin, best known for starring in the 'Home Alone' movies, was arrested and briefly jailed before being released on $4,000 bond. Submitted by Jmahalak on Thu, 2010-09-23 23:15. The people who nit-pick others imperfections are only doing so because they are insecure with there own image. Submitted by Shelly Shores on Tue, 2010-08-31 04:35.
Who cares about his "non aligned" nose? Doesn't it upset you that he had pot, xanax and sleeping pills in his possession? You're as petty and pathetic as the egotistical movie stars! I hope the young man has gotten off drugs and is happy in his life currently. Submitted by me...duh on Sat, 2010-08-28 12:51. Submitted by oingoboingo on Fri, 2010-09-17 19:20. @me...duh - He's been dating Mila Kunis for years. I think they live together. Submitted by Watsons Pills on Mon, 2011-04-04 23:33.